This Reduced Height School Locker Nest of 3 is perfect for younger, smaller users and also where there is a space or height restriction in a room. 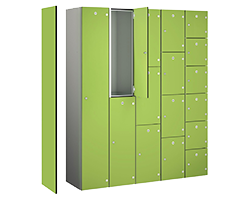 This locker is ideal for use in schools and is available in 6 door colour options. Camlocks are fitted as standard with the option of choosing a padlock fitting or other lock types. Next Day Delivery is available on selected products and at additional cost - see Express Delivery Lockers. Please review our Delivery Terms before you place your order.